I would, for the most part, describe myself as a backyard naturalist. Although I am fortunate to have a large forested area within easy walking distance, I live in the heart of a small urban city. And yet there is a great deal of nature to be observed right outside my backdoor. If you become interested in the natural world you live in, you will soon discover that there are hundreds of little dramas being played out in your world every day. Today’s photograph illustrates just one fascinating relationship. 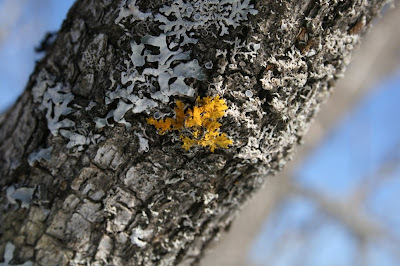 On a recent walk I photographed this yellow lichen (Xanthoria lichen) growing on the bark of a tree. Lichens are very special in that they consist of two completely different living organisms which need each other to survive. Lichens are made up of a fungus and an alga. The alga uses sunlight to photosynthesise or make carbohydrates. The fungus uses the carbohydrates for food. This is called a symbiotic relationship. Lichens come in an enormous variety of shapes and colours. They can grow just about anywhere and are found at all times of the year. Since they are symbiotic organisms, the fungus cannot survive if the alga is killed off by pollution. Because of this lichens are extremely important indicators of the health of our environment. Scientists are currently developing methods of biomonitoring that use lichens to great advantage. Perhaps the next time you see lichens you will consider the unique relationship this organism has within itself and with the environment around it. This is the same environment that you live in. Chances are that if the lichens aren’t healthy you won’t be healthy either. This is just one of hundreds of interesting relationships that you can observe in the natural world that is all around you. April 2, 2008 at 6:06 p.m.
April 3, 2008 at 9:15 a.m.